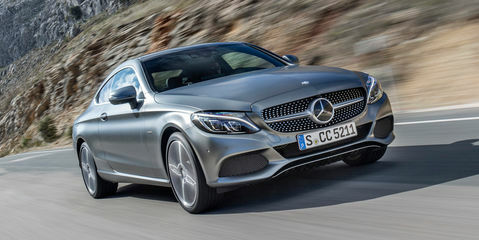 The 2016 Mercedes-Benz C-Class Coupe lands, in time-honoured tri-star tradition, to add an extra layer of class above the sedan and wagon Cs. However, its formula of trading lifts in levels of comfort, style and sportiness for an extra hip pocket hit and a reduction in general practicality is a tricky one to balance in this new generation because, frankly, this coupe’s rather fine four- and five-door twins are already brimming with the good stuff. In short, the new two-door faces a harder slog to maintain its ‘platinum status’. Success or failure, then, is easily measured in how much higher Coupe lifts C-Class’s game and how much more special it feels. 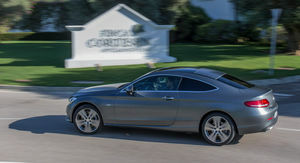 Punting across the lightly trafficked, smoothly manicured Andalucían roads in Spain aboard Euro-spec examples at the ‘C Coupe’ international launch is, at best, a blurred snapshot of how the yet-to-be-specified Aussie versions will fare locally once they land in March 2016. But there’s bright light behind the murk. The Australian range will skim off half of the eight variants launched in Europe, and our four are the peachy versions at that. Bottom up, Oz passes on the poverty pack 115kW/250Nm 1.6-litre C180, instead kicking off with the C200 and its 2.0-litre turbo four with a more respectable 135kW/300Nm. 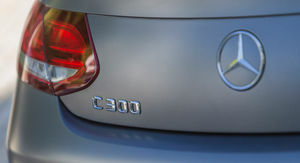 Similarly, our sole turbo diesel model, the C250d, will offer an extra 25kW and 100Nm from its 2.1-litre four beyond other markets’ entry 125kW/400Nm C220d. 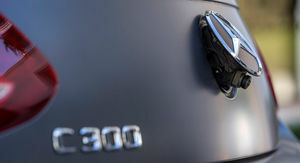 Australia leapfrogs the 155kW/350Nm C250 petrol and jumps to highest-powered 2.0-litre turbo petrol of the range, the 180kW/380Nm C300. From there, March’s initial rollout takes a massive leap up the price/power/performance scale to the monstrous range-topping Mercedes-AMG C63 S Coupe, its 375kW/700Nm twin-turbo 4.0-litre V8 25kW and 50Nm up on the regular, not-for-Oz C63 Coupe. So four versions in an all-four-and-eight-cylinder range, at least until the Affalterbach-tickled C450 Coupe AMG, with its 270kW/520Nm twin-turbocharged V6, rounds the local range out late next year. 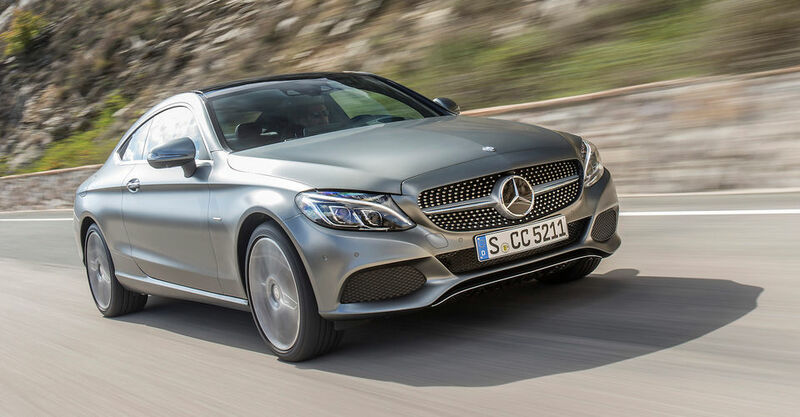 The positive news from Mercedes-Benz Australia is that all variants will be “heavily spec’d” though the range pricing will be “similar to the current C-Class”. That means roughly a $60K entry point, a circa low-to-mid-$70K mark for the diesel and high-spec petrol four, and around $160K for the mighty C63 S version. 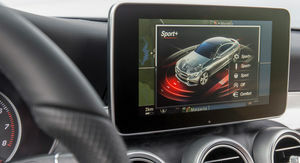 Though little in the way of concrete spec has been confirmed, it will be an all-automatic affair – seven speeds for petrols, a new nine-speed for the diesel – while the C300 will come standard with AMG Line styling enhancements outside and in. Those enhancements? A chrome diamond pattern grille; guard-filling 18-inch five-spoke AMG style wheels, subtle body accoutrements with twin exhaust outlets, Artico/Dinamica man-made leather and microfibre seat coverings, black open-pore ash and brushed alloy trim inserts, a flat-bottom multifunction steering wheel and alloy pedal set. And all as fitted to our Andalucían C300 test car, which, on standard ‘Agility Control’ steel-sprung suspension, should be reasonably indicative of the due-for-Oz version. 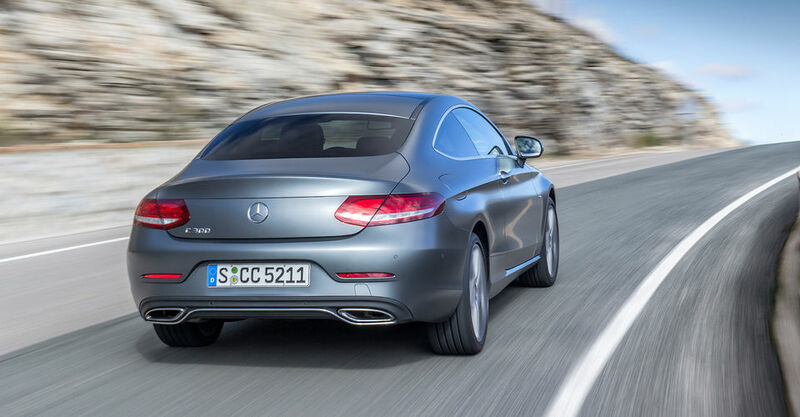 While the diamond grille and “droopy bum”, as it’s been uncharitably described, have been hallmarks of the smaller CLA-Class, in proportions, presence and panache the C Coupe owes much more of its design linage to S-Class Coupe. The whopping wheelbase – 80mm longer, 60mm of it between the firewall and front axle line – brings with it a sort of slender elegance in shape, which is balanced by masculine and muscular character lines and an AMG-like front fascia. There are neat devils in detail, too: the frameless windows, the flush LED tail-light lenses, the way the wing mirrors mount to the door skins (not the side glass aperture), and how edgy character lines blend smooth around the tail area panels. Longer (95mm), wider (40mm) and lower (just, at one millimetre) than its predecessor, the new coupe looks squat on the road and farm fresh in the flesh, where its styling is more convincing than it appears in pictures. It’s a true-to-tradition two-plus-two-seater, and none of this kiddies-sized second-row seating rubbish either. There’s enough room for four average-height adults… just. 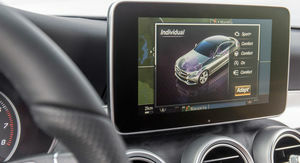 Merc claims that there’s now more head, shoulder and elbow room in all four positions, though you might have to have just climbed out of the old car to notice. 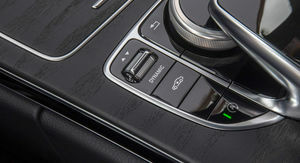 There’s a little more styling flair in the of dash-fascia-to-door trim flow, but the design of the instrumentation and controls, the ‘floating tablet’ infotainment and rotary dial/touchpad console controller and the switchgear are safe and familiar Benz territory. 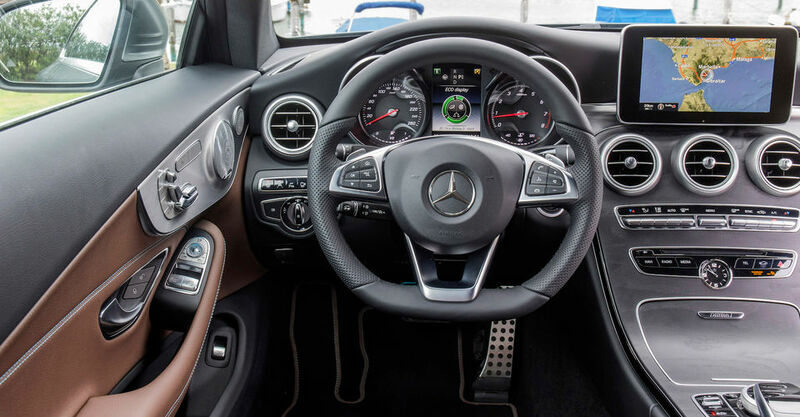 The combination of brushed alloy, black oak, carbonfibre and double-stitched faux leather presents as nicely as, well, the great raft of other Mercs featuring a near-to-identical treatment. There are high-class flurries here and there – the alloy look seat adjustment panels on the doors, for instance – but there’s not a lot of added wow factor at play. The front seats deftly balance support, purpose and long-haul comfort as much as the stiffly padded, flat-backed rears don’t – the ‘plus two’ rear seats set quite inboard in reaction the narrow cabin width in the back. Back here, it’s headroom that suffers most. 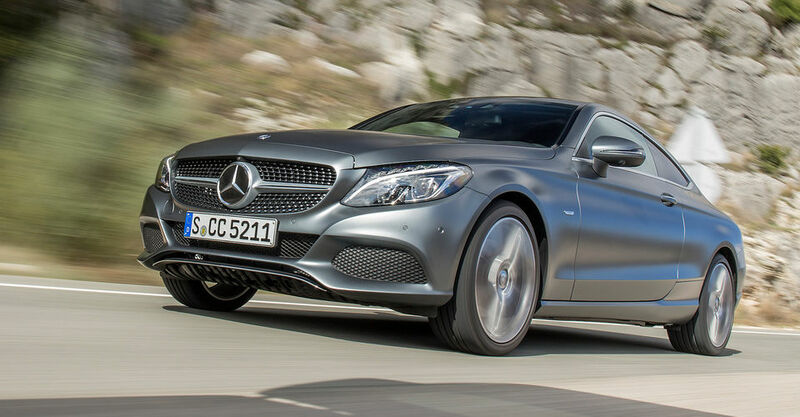 If you’re a breeder of basketball players, best explore other C-Class body styles. Thankfully, the rear pews not only feature Isofix mounting points, but rear passengers get individual air vents, too. And while the front seats do slide forward automatically to aid rear entry and egress, the narrow gap presented makes climbing in and out of the second row a feat best fit for gymnasts. Boot space, too, falls victim to (coupe) form over outright functionality, though while it’s relatively narrow and short in height, the load space in actually very deep. 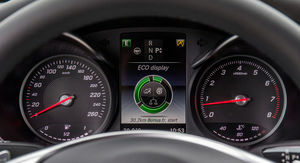 The hardest tuned of the range’s 2.0-litre turbo fours, the 180kW/370Nm will propel the C300 to 100km/h from a standstill in a claimed six seconds flat, which is hardly hanging about. And with a combined fuel consumption claim of 6.3 to 6.8 litres per 100 kilometres (depending on spec and options) it’s hardly what you’d call thirsty. The pluses continue. 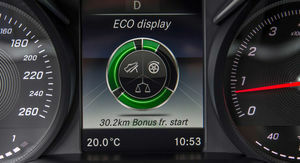 It’s mated to Merc’s evergreen 7G Tronic, which does an excellent job of presenting an ideal shift in character regardless of which (Eco, Comfort, Sport, Sport+, Individual) drive mode you select. Engineers have also managed to tune in a nice, satisfying if muted rasp to the exhaust note under load. Despite all of this, the engine just lacks a bit of soul. It does the job but doesn’t pull the heartstrings – at the same heartstrings that the coupe’s looks and upmarket vibe promise. It lacks a sense of serene refinement and an effortless undertow of torque befitting a luxury coupe, a boulevard cruiser, an open-road engager, a long-distance hauler. The engine meets the brief objectively, just not emotionally. 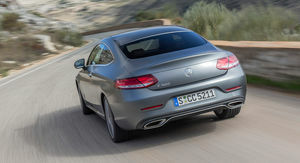 Call me a luddite, but a premium luxury coupe begs for six silken cylinders, whereas it merely makes do with four. 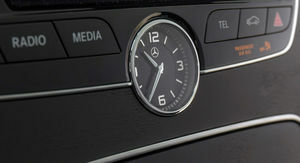 The C300 engages the luxury-performance handling mandate more confidently. 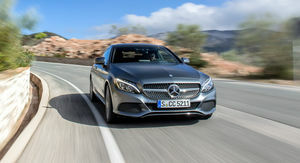 Compared with the standard C-Class sedan, the suspension is 15mm lower and more firmly set, though it’s amply compliant across the balance of Spanish motorways and back roads. The suspension damping has a nice roundness to it: both the compression and rebound strokes are smooth, the chassis doesn’t float across or bounce in protest to big mid-corner bumps, and body control never seems to gets unduly flustered. 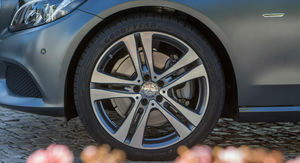 Tyre size is a modest 225mm up front and 245mm in the rear, and the chassis seems to harness the available grip stridently. 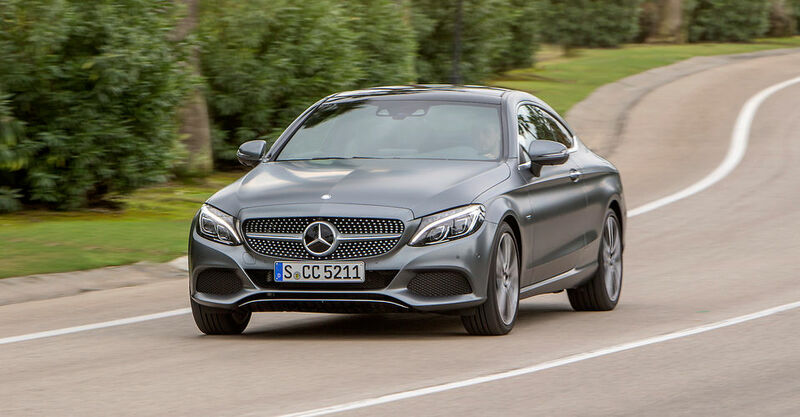 Crucially, the C Coupe engages the driver to enough of a degree to justify its position as sportiness leader of the mainline C-Class breed. It’s a fun car to punt, though clearly tailored more towards gentleman’s grand touring than that of tail-sliding, boy racer theatrics. It steers confidently, pulls up under braking with unflustered gusto, and while it’s neither a land barge nor a track car, it strikes a middle ground for driving enjoyment and engagement that suits its agenda. If there’s a gripe, it’s the noticeable tyre roar from the Continental rubber (and, for that matter, wind noise from the wing mirrors at highway speeds). Whether the 300 thumps and crashes across the third world surfaces Aussies contend with everywhere from Newtown to the Nullarbor remains to be seen. Safety? 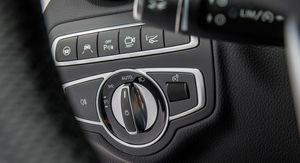 Well, in Europe at least, the range comes with nine airbags (frontal driver and front passenger; driver’s knee; two front thorax; and front and rear window bags) as standard and rear side bags as an option. 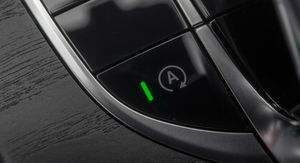 Also standard issue overseas is Prevention Assist Plus, which presents audio and visual collision warnings while integrating the rather nifty Adaptive Brake Assist: collision mitigation or prevention by applying autonomous braking at speeds of up to 200km/h. 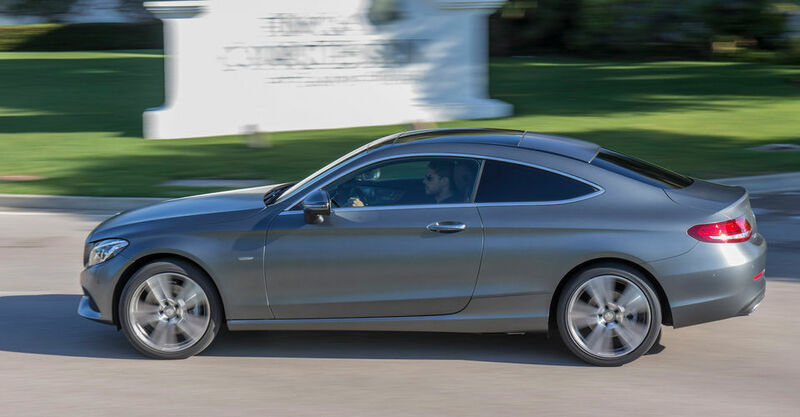 Presumably the Coupe will at least match local C-Class sedans and estates for Benz’s usually high levels of standard safety equipment. 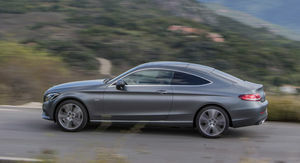 But does the Coupe excel above the sedan and wagon where it needs to the most: in comfort, style and sportiness? The short answer is: depends. And much of that ‘depends’ hinges in the final spec that arrives in March. Comfort? While the steel sprung suspension proved impressive in Spain, the jury is out on how well with works across the pond. We did sample the Airmatic system – which can be set for continuously adaptive damping – at the international launch, and it provided excellent ride with zero dynamic compromise. And may prove an essential cost option in Aussie conditions. Style? A solid nine out of 10. If you’re not yet convinced by the pictures, wait until you see it in the flesh. Sportiness? On limited evidence, it’s amply, though not generously, sporty. And I can’t help think that the requisite powertrain vibe starts with six cylinders. The 250d diesel? 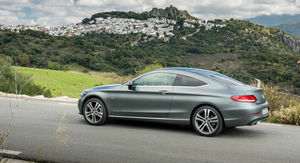 We’ll have to wait until the C-Class Coupe lands locally for a proper appraisal. As for the mighty C63 S Coupe: well, you can read all about that beast right here.